Schools are beginning to transform their assessments from standardized testing to ePortfolios. According to the list of 21 Things That Will be Obsolete in 2020 by Tina Barseghian, The Role of Standardized Tests in College Admissions came in at number five! Barseghian writes, "The AP Exam is on its last legs. The SAT isn’t far behind. Over the next ten years, we will see Digital Portfolios replace test scores as the #1 factor in college admissions." It will be important for your students to begin creating an ePortfolio so they will be Ahead of the Technology Curve by the time schools start using this new form of assessment. 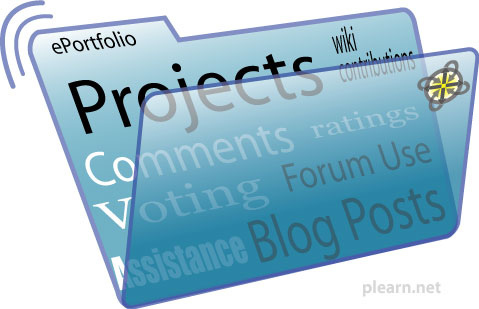 Creating an e-Portfolio is extremely vital our students' success in the workplace. Students need a place to collect and showcase their best projects and assignments for college applications and future employment opportunities. I am just starting to emphasize the importance of e-Portfolios to my students by allowing them to start making a collection of their projects. I love the fact that instead of saying, “hand in your assignments,” I can now say, “publish your assignments and send me the link.” With this mentality, my students will think about connecting and sharing their learning with the world around them. Here is a video that shows how students use e-Portfolios to prepare for college and the workplace, as well as the benefits associated with them. I have my students create (collections) or folders in their Schoogle Account to start collecting and saving their projects and assignments for my class. In addition, I also have them upload assignments that they have completed for other classes so that they can start organizing them in their Schoogle Account. This ultimately acts as an ePortfolio, a place where they can collect, share and eventually showcase their best work from high school to use for their applications to college and jobs out of high school. Some teachers are even encouraging their students to use Evernote as an e-Portfolio. Rob Van Nood is a teacher who developed three levels for students to develop an e-Portfolio with Evernote. Level 1. Portfolio as Storage/Collection This is the most basic level of creating an e-folio. At this level staff and students are collecting work and storing it. At this level the role of the teacher is to provide students with guidance on the types of artifacts to save and how to save them. Level 2. Portfolio as Workspace/Process At this level learners reflect on their learning as represented in the samples of their work. Students could be reflecting in a variety of ways that can be linked or connected to their work. (Reflection sheets, Rubrics, Blogs that are linked to their work, Questions provided by a teacher to answer, etc). At this level the role of the teacher is to to provide feedback on students work so they can recognize opportunities for improvement. Teachers are also working to support students in how to reflect on their learning. Students can be reflecting on individual pieces or growth they notice over several pieces of work. Level 3. Porffolio as Showcase/Product At this level students organize one or more presentation portfolios around a set of learning outcomes, goals or standards (depending on the purpose and the audience). The reflection that goes with this level is retrospective, thinking back over the learning represented in the specific artifacts selected as evidence of learning. The teacher’s role at this level is to provide feedback on the student’s work but also to validate the student’s self-assessment of their work. It's good to see this amazing informative post.